Having my boys is a bit like having dogs. They need regular walks to stop them going a bit crazy indoors. Big Bear in particular needs to leave the confines of the house at regular intervals. Luckily he loves being outdoors in all weather. Little Bear is more of a fair-weather man. If it’s too cold and wet he gets a bit grumpy. We’ve had some pretty nice weather recently so we’ve been spending lots of time in the garden exploring. Today is National Gardening Day so to celebrate, I thought I’d share some of our favourite outdoor activities. While seeking out creepy crawlies really isn’t my thing, the Bears are fascinated by anything that moves. We can be regularly found at the bottom of the garden, digging holes for worms and looking under bricks for woodlice. Sometimes I’ll give Big Bear a pot and a list of creatures to find. Once he’s finished we’ll look at the creatures more closely to identify them and talk about what they look like. A great activity for indoors or outdoors, whatever the weather. Fill a big box with compost, plant pots, and carrots with a feathery end. Let them loose with spades, trowels and fingers so they can pretend to plant and pull up carrots, fill the plant pots with soil and explore the different textures. A few years ago we bought a kit from Insect Lore so growing butterflies has become an annual event in our house. The Bears love watching the caterpillars grow and change. Releasing the butterflies at the end of the process is an event too – one of them was clinging to Big Bear’s jumper for about 15 minutes last year. Kids love a good treasure hunt and an outdoor scavenger hunt is one of the best. Write down or cut out pictures of things you’d like them to collect in the garden or on a walk, give them a seaside bucket each and away you go. Another treasure hunt idea. If your child is learning their numbers, hide the numbers from one to 10 in the garden (we used the large foam numbers you use in the bath). Once they’ve found them all, or think they’ve found them, they can lay them out to check. Get them to recognise and name the numbers. Who doesn’t love jumping in puddles? If you’re prepared with waterproofs and wellies, let the kids go crazy jumping in and running through puddles in the park. Big Bear loves puddles so much he even has a favourite at the bottom of our street. Collect flowers from the garden or on a walk and press them in a flower press, if you have one, or in heavy books. If your kids like crafts, make pictures and cards with your finds. A very kind friend recently bought us a tuff tray. There are a million uses for them but so far we’ve mainly been using it for water play. Specifically Paw Patrol in the water. Other water play ideas for the garden include running through the sprinkler and painting water pictures on the ground or wall with a paintbrush. However, our current favourite water activity when it’s hot outside is using the water slide, which runs from one end of the garden to another. The Bears also like to go down it in an inflatable. What are your favourite garden activities? I’d love to hear in the comments below. Sharing is caring! 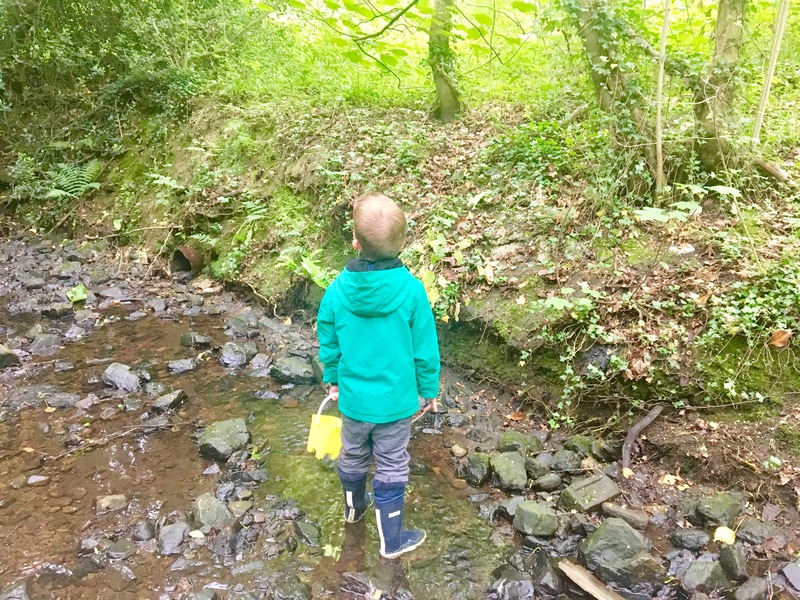 If you enjoyed Find joy in summer nature exploration and know someone who would find this post useful, please share it with them. Totally! On the odd occasion we’ve not been out in the morning I’ve regretted it.. I had no idea you could grow butterflies! I’m not a great fan of caterpilars mind, so it might not be for us! It’s pretty amazing – look it up on Amazon. Having said that, the caterpillars go through a disgusting fat stage first so it might not be for you! Haha! I always say that about my boys and people just look at me oddly! Really lovely ideas, I’m loving all the nature posts and ideas at the moment. Hoping it will keep us busy during the summer holidays. Your intro to this post made me smile, whilst my little boy is racing around the house and my dog is asleep at my feet! Time for an escape into the garden now, and very much liked reading your ideas, thank you for sharing!